Our house. A very very very fine house. For years, we didn’t know who the architect of Campbell House was. It was assumed that the developer used stock architectural plans, or William Fulton — an architect who designed buildings for James Lucas — was responsible for the design. Now we know who the architect (in this case, architects) really is. houses with finished basements, stables, etc. The architects — Joseph C. Edgar and Thomas Waryng Walsh — worked together for three years, between 1850 and 1853. During this period they completed five public buildings including Disciples of Christ Christian Church on Fifth Street [demolished], Old St. Vincent’s Catholic Church in Cape Girardeau, and the Kirkwood Hotel [lost to fire in 1867]. 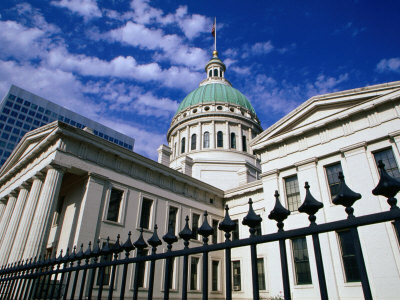 The Old Courthouse was built in the Greek Revival style in 1839, twelve years before Campbell House. Since the Campbells lived here for 84 years, they changed a few things. They added a large kitchen on the back of the house. They enclosed a side porch to make the Morning Room (a small sitting room). 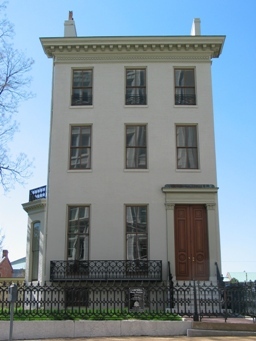 In 1867 they added a floor on top of the two-story flounder to create three more rooms. 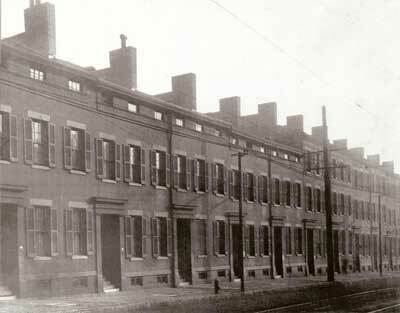 The Eugene Field House was the second-to-last house in Walsh's Row of twelve attached homes. Note the placement of the building right next to the sidewalk with no room for a front yard. The Eugene Field House was saved from the wrecking ball when the other eleven homes were demolished in 1934. 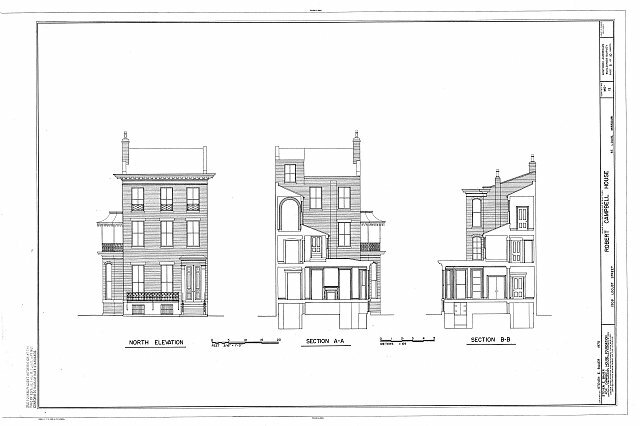 Front, rear and cutaway elevations of Campbell House. 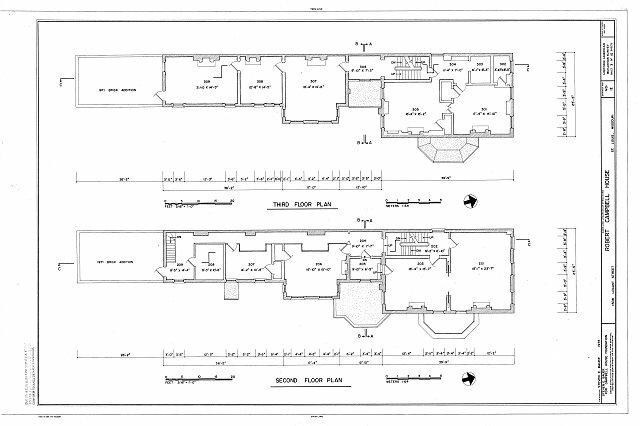 Floor plans of the first (top) and second (bottom) floors of Campbell House. To get you started, click here to download and print a blank floor plan, then click here to download and print a blank elevation plan. First, draw the floor plan of your house, using the blank plans you just printed and colored pencils, markers or crayons. Be sure to label each room: kitchen, living room, bathroom, your bedroom, and any other rooms you have. If you have a second (or third!) floor in your house, draw a separate floor plan for each floor. Not all rooms are perfectly square or rectangular, so draw the rooms true to their shape. It may help if you sit in the middle of each room and can see how all the walls come together. Make sure you include doorways and windows! When you finish your floor plan, use the printout of the elevation plan to draw an elevation of the front of your house, complete with doors, windows, steps and any decorations that may be on the front of it. Is there a garage attached to your house? Is your house made of brick or wood or stucco? Include as many details as you can that make your house special. After you’re done with your elevation and floor plans, have show and tell with your friends to explain the rooms of your house and what you like best about each one. When talking about the elevation, be sure to tell your classmates what makes your house unique and different from all the other houses or buildings on your street. If you want to share what you did, email files over to shelley [at] campbellhousemuseum.org, and we’ll share your drawings on our blog! We hope you enjoy making drawings of your house, and be sure to check back in two weeks for another fun activity! Executive Director Andy Hahn with his unusually shy Leo before our urban exploring field trip to the St. Louis Transit Company Substation on Locust this morning. Campbell House research volunteer Tom Gronski’s article on the Campbell House architects (Joseph C. Edgar and Thomas Waryng Walsh) earned top-billing in the Missouri Valley Chapter of Architectural Historian’s newsletter. Read all about it (and some other beautiful local buildings) here. Way to go, Tom! A long-vacant building up Locust was built to house a big, giant battery system for streetcars. It was constructed right before the 1904 World’s Fair because the city anticipated substantially more streetcar traffic due to the influx of visitors. 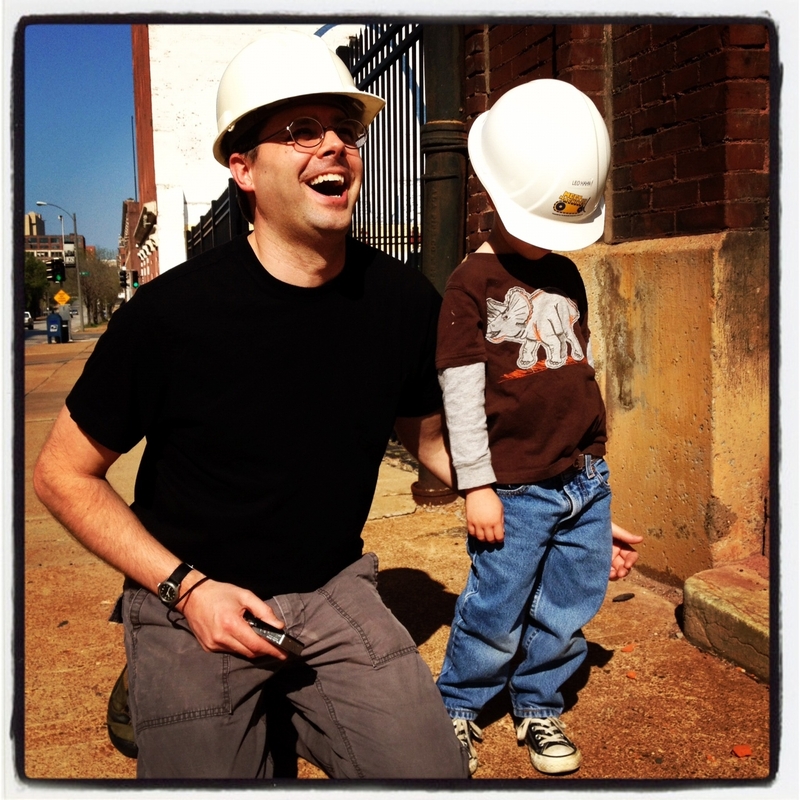 We’ll have a post about our visit to the old building complete with pictures for you next week. Lindsey’s plugging away on research, writing, and finding objects for her new exhibit on the Campbells during the Civil War. 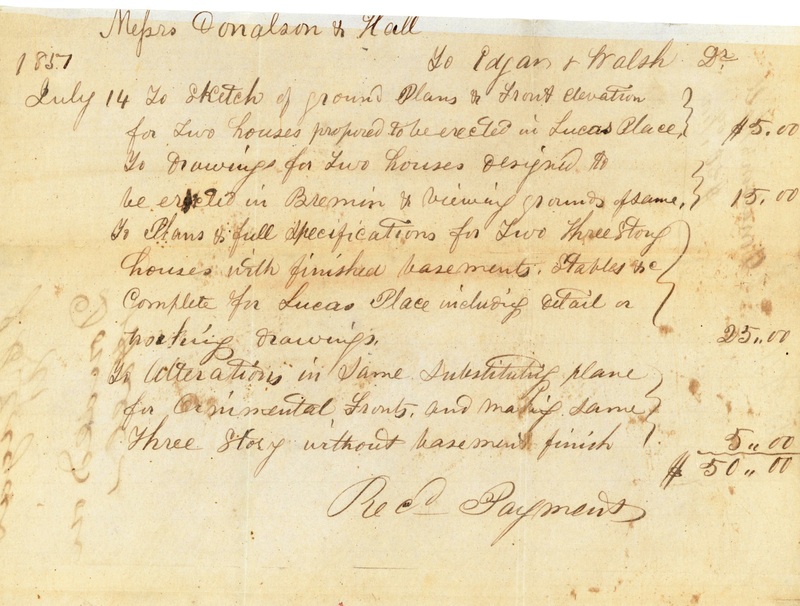 Sharing new research on Robert’s political leanings, slavery, and the impact of the war on the family and their friends, the exhibit will open in the third floor galleries in early April. You won’t want to miss it! We have more intern interviews booked, but we’d love to hear from you or someone you know needs a summer internship. We’re not picky about your course of study because it takes all kinds to operate a museum. Nonprofit Management? Museum Studies? PR/Marketing? History? Art? Come talk to us. Campbell House is a small place, so everyone — staff, volunteers and interns — wear many hats. You’ll get to see all sides of how we run the business, and we promise you’ll have an awesome experience here. Contact Executive Director Andy Hahn at andy [at] campbellhousemuseum [dot] org if you want to talk; we’d love to hear from you! We’re working on putting together two spectacular events that you won’t want to miss. In just a couple of weeks, we’ll again be hosting the Magical Spring Thing at the Mahler Ballroom, which will feature St. Louis Ballet, Union Avenue Opera, the St. Louis Ragtimers, the Ballroom Academy of St. Louis. It’s going to be an unforgettable evening, so click here for more information. On Mother’s Day (May 13th), we’re pleased to partner with Union Avenue Opera to bring you (and your mom!) Arias in the Afternoon: A Victorian Garden Party. While you enjoy scones, tarts and tea from the London Tea Room, Union Avenue Opera artists will serenade you with a special Mother’s Day program. For details, read all about it here.